Today’s eyesight requirements have never been greater. We need good vision for not only everyday tasks, but an increasing number of us need vision that makes our work and home life and our sports and hobbies easier and safer. The lens consists of two separate areas. The upper area is generally used for distance vision and the lower segment for near vision. The reading segment is available in different shapes and sizes depending on your individual requirements. The bifocal is the preferred lens for people who need a correction for distance and near vision but want the convenience of not having to swap between two pairs, however the dividing line can be a problem for some patients and cause ‘image jump’. Similar to the bifocal lens but includes an extra segment between the top and the bottom of the lens, it has two dividing lines. This allows you to see at three different distances; usually far distance, near and middle distance. This lens type gives you optimal clarity of vision for driving during the day and up to 90% less reflection at night, leading to a decrease in glare. Certain lenses designed for office work allow good vision for the computer and reading, greatly relieving eye strain. 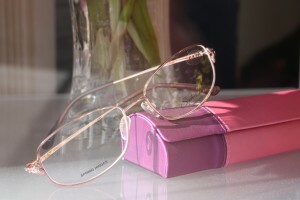 Other lenses are designed for sports ie cycling, sailing, tennis and golf. These generally include certain tints or coatings to enhance your vision, thus improving your visual performance.